This grill has been discontinued. It has been replaced by the Jenn-Air 52,000 BTU Gas Grill (model #720-0337). This line of grills has been very successful. For 2006, this unit has been redesigned to address issues of low heat output, bad casters and assembly problems. The price has increased to $899USD, but still a very low price for a full feature stainless steel gas grill. 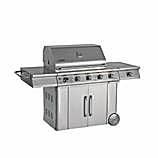 The emphasis on delivering a full function, all stainless steel gas grill has limited the overall construction quality. While this is a good grill for a good price, you do get what you pay for. First of all this grill is a Lowe's store brand grill. They licensed the name Jenn-Air and hired Nexgrill of China to make it. While Lowe's pushed the Jenn-Air name, they had nothing to do with this grill and do not support it. Support is provided by Lowe's Stores. Do not buy this grill because of its name. Support for these grills has been improved since these grills were introduced in 2004. Having said that, this is a decent gas grill for the price. You get a complete stainless steel unit with three cast brass burners, 52,000 BTUs under about 550 square inches of primary grilling area, a 12,000 BTU flush mounted side burner and a 14,000 BTU rear mounted infrared rotisserie burner. While you get the burner, you have to pay extra for the rotisserie system. On the plus side for this grill the dual layer stainless steel protects the appearance and reduces the external heat, making it safer to use. The ceramic briquette barrier won't necessarily reduce flare-ups, but they do distribute the heat well. The BTU rating from the main burners is good, but still just a little low. Preheat times should be too long and you will get good heat on the stainless steel grates to sear. The downside of this grill is that it isn't built to last. While you will get many years out of it, I don't believe it would make it to ten. A lot of attention is placed on appearance and features at the cost of durability. However, most owners of these grills are satisfied.